Get a drawing tipsheet when you sign up for our mailing list! Want to recreate 1000 things to draw at home? You're in luck! We've created a special PDF for you to cut out and play at home. Just follow the instructions to bring 1000 things to draw to life! 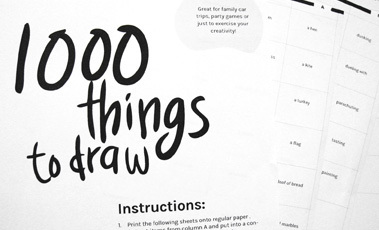 1000 things to draw is a fun challenge for everyone, young or old! Our mission is to challenge YOU to draw something completely random and silly to flex those creative muscles! 1000 things to draw is a free web app. Just use the simple interface above to get new suggestions on what to draw (we know you're stumped from time to time!) And If you'd like to turn it into a game, we've got that covered too: download the PDF and bring it wherever you go! To share the topic with your friends, just select the displayed link, copy and share it with your friends! 1000 things to draw is the brainchild of Amy Ng, the editor of popular drawing and illustration blog Pikaland. One day she got tired of asking herself "what should I draw?" so she designed a way to leave it to chance instead. Whether you're drawing a hippo wearing a tutu or a sock invading a fridge, it's always more fun when you invite others to join in. Go on and spread the word! Use the hashtag: #1000thingstodraw on your drawings and share in the fun! Follow us for more cool projects! Invite others with a tweet! Upload your drawings in the group pool! This website is part of the Pikaland family. Drawn, designed and conceptualized by Amy Ng.